Portable Class Libraries are a great way to share common code between different platforms. But here lies the danger: A portable class library project cannot change the underlying platform. Here’s a simple explanation of what that means. Few minutes and everything is done, so the testing phase begins. Cookies and CookieContainer especially are different beasts in different platforms. Portable Class Library cannot hide that fact. Have you encountered similar issues when dealing with Portable Class Library projects? 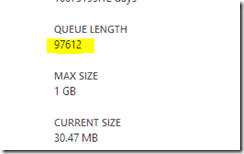 Hyper-V is required when one wants to do Windows Phone 8 development, which I do quite much. And that’s it, the Hyper-V is now available. If you turn off the computer at some point, the Hyper-V gets disabled until you boot into Mac OS X and run the Parallel Desktop again. So it’s better just to put the MacBook to sleep. 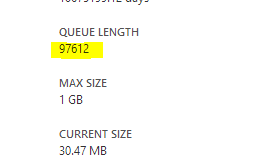 I suppose this is just a bug in the firmware as MBA 12 seems to support the Hyper-V just fine. But, until the bug is fixed, this works as a workaround. Thanks to TigerG for posting his findings at MacRUmors. After my TechDays’ presentation I was asked why we prefer to use Azure Virtual Machines for our web site hosting instead of Azure Web Roles. Here’s a little more structured answer to that question. Even though the original question didn’t touch Azure Web Sites, I thought about covering that option too. The Azure Web Sites is a great platform but it has a one big glaring problem, making it unsuitable for the production usage: The lack of support for custom certificates. Other than that, Azure Web Sites offer really fast and easy deployment options and also the Node.js is supported. The Azure Web Roles provide the support for custom certificates and for Node.js, making it ready for production usage. But the platform lacks in the ease of deployment. By default, updating a site is slow and it’s hard to run multiple applications in the same Web Role. The last bit is especially true if one wants to run both Node.js and ASP.NET apps on the same role. The Azure Web Role platform pushes the developer into the “one app, one service” direction. This causes problems when you have limited resources (money). IIS configured to use “shared configuration” and “Centralized Certificate Store”. Here’s our requirements and the hosting options collected into a single table. Windows Azure Accelerator for Web Roles deals with the deployment problem of the platform. Unfortunately, the original project is now deprecated. Fortunately, robdmoore’s fork of the project is been actively developed. The tools for running a private Azure Web Sites platform are available from the Web Platform Installer (Windows Azure / Service Management…). It seems that these tools support custom certificates. More info about this solution is available through the Microsoft.com/hosting. But these have some limitations which may be hard to get around: In the case of a VM, if it goes down, everything stops. With Azure Service Bus you need some service which handles the scheduling. This is where the Quartz.net fits in. Quartz.net is a flexible and easy-to-use library for running scheduled tasks. And it works great on Azure. In this tutorial we build a Quartz.net (version 2.0.1) cluster using SQL Azure and ASP.NET. First we need to set-up the SQL Azure database. Quartz.net will persist all the job details and triggers to this database. Easiest way to create the required tables is to use Management Studio to log in to the database and to execute the Quartz.net database schema creation script. And that's it for the database. Next step is to build the service for running the Quartz.net. The SQL Azure store is ready and now we need a service which will run actions based on the triggers. The service can be almost anything: a console app, a Windows Service or an ASP.NET project. In this tutorial we're going to use an ASP.NET project which is deployed to two extra small Cloud Service instances. 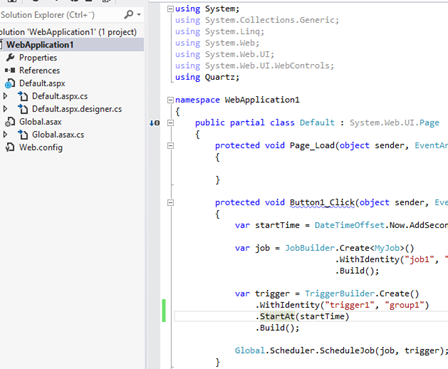 Create new project with template "ASP.NET Empty Web Application"
Use NuGet to install package "Quartz"
That's it. The service for running the scheduled jobs is ready. As the last step we're going to create a simple job and a schedule for it. All the bits and pieces are ready and only thing left is to test out the service. For that we need a job to execute and a trigger which will handle the execution. As the service uses ASP.NET, it can be deployed to Azure Web Sites or to Azure Cloud Services. One thing to keep in mind is that the IIS will recycle the application pools automatically. This will shut down the application and the Quartz.net with it. To get around this limitation, it may be wise to change the application pool's recycling interval to 0. Another option is to create Quarz.net job which "pings" the current web site once in every 10 minutes or to use some other keep-alive service for the pinging.